I think it's safe to say that fans and teams both approached the Hungarian Grand Prix with apprehension. We know it can sometimes fail to deliver in terms of action, overtaking and entertainment, whilst they had an awful lot of unknowns to deal with. New tyres, higher temperatures and all the bonuses from that Silverstone test. Of course, Mercedes weren't at that test but it didn't seem to hinder them one little bit as they secured pole position and race victory in a superbly strong showing. The evident surprise from both driver and pit wall when Lewis Hamilton stormed to pole position was beautiful. With Sebastian Vettel seemingly on his supreme Saturday form, there was little chance of anyone getting close to him. It only takes a little chance, though, and Hamilton snatched it up, grabbing himself a front row grid slot. All the talk recently has been on how much the Barcelona tyre test helped them, or on how much missing out in Silverstone would hinder them. With the Hungaroring seemingly offering up a level playing field again, I wasn’t alone in assuming Mercedes were going to struggle in the higher temperatures and we’d see a repeat of their backwards trajectory from earlier race weekends. Rosberg didn’t have a particularly fruitful weekend. He was high up the grid on Saturday, but had nothing to give during the race. A collision with Vettel on the first lap led to his engine eventually giving up, leaving him stranded at the side of the track. It was left to Hamilton to fight and it all came down to a crucial pass on Jenson Button, that took nearest rival Vettel at least ten minutes to achieve the same. With a healthy lead at a track he’s very comfortable on, Hamilton soared to victory – his first for his new team. Mercedes are keen to play down any raised expectations regarding title hopes, and reiterated that the tyres can behave very differently at each track. Being strong in Hungary does not automatically mean the pace will be there in Belgium, but this was a very together performance from the German squad, one that shows they are still in the fight. Hamilton has been quite open about his recent heartbreak, but it seems as though this time the emotional rollercoaster in his personal life has not affected his on-track skills. 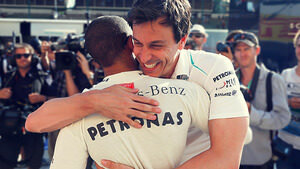 With a focused Hamilton and a team on the up, Mercedes really do have it all still to play for. Overall, this has been a very encouraging weekend. In extremely hot conditions, we maintained our Saturday afternoon competitiveness on Sunday afternoon and it certainly feels like we have made a good step forward today. Amidst swirling rumours about the potential departure of Kimi Räikkönen from the team, Lotus turned up to Hungary knowing they finally had the higher temperatures that they have been hoping for. Much has been made of Kimi’s continuing record of points finishes, and whilst they do show an astounding consistency from the Finn, they don’t add up to the victories he really cares about. Unfortunately, this weekend was to be no different, and it was yet another second place for Kimi in Hungary. From sixth on the grid, it was a steady race for Kimi, an impressive two stop strategy allowing him to make progress through the field to score a podium finish. His tyres dropped off over the last couple of laps following a tough final stint, but he kept hold of that second place for another handful of very useful points. A quiet but rewarding race is exactly the opposite of what Romain Grosjean experienced. Two high-profile incidents were investigated by the stewards. One particularly brutal overtake on Jenson Button led to a belated punishment, whilst a move that ended up with his wheels just off track was given a drive through penalty straight away. It had been a good qualifying for Romain, and he started on the grid third, ahead of his teammate. He had a clean first corner, and was heralded for some of his more sensible fighting out on track, but it’s another race full of collisions, another event where Éric Boullier has to stand up and defend him. Despite the trouble, Grosjean still managed to secure sixth place when the chequered flag dropped. Another healthy double points finish for Lotus. Kimi admitted that he’d given himself a lot of work to do by qualifying poorly on Saturday, whilst Romain started high up on the grid but wasted the opportunity in the race. If we could combine these two drivers together, Lotus might again be on to a winner. With so much attention being given to who will replace him, Mark Webber would be forgiven for feeling a little overlooked this weekend. After qualifying, it didn’t look like he would have too much opportunity to shine in his own right, a double whammy of problems halting his progress up the grid. With a recurrence of the KERS failure that has dogged him since its introduction to the car, plus a gearbox issue that slowed him down, Webber had to settle for tenth place on the grid. He was very unhappy with that, particularly at a track notorious for poor overtaking opportunities. Sebastian Vettel was also disappointed, despite securing a front row grid slot. He was the clear favourite for pole, and the aforementioned surprise felt at Mercedes when Hamilton scooped P1 was felt adversely within the Red Bull team. Two disappointed drivers with a lot to prove led to a feisty race from both. Vettel lost time stuck behind Jenson Button and ended up third, but still picked up a healthy dose of points for his championship lead. Webber, meanwhile, tried an alternative strategy, starting on the medium tyres to everyone else’s soft compounds. He fought his way up to fourth and then settled in behind his teammate. A good recovery drive from him, and a strong performance from Sebastian, and the team are still in the box seats for both titles. Fernando Alonso’s post-race pronouncement that the best birthday present he could have was a car more like his rivals got him in to some hot water. The numbers on the day don’t look so bad – Alonso was fifth on the grid and maintained fifth in the race, Massa started seventh and dropped one position on Sunday – but they belie a difficult weekend. There was never a moment where it seemed the Scuderia could be fighting for a podium, let alone a win. After the race, as well as wishing for new machinery, Alonso said that fifth was better than perhaps they even deserved. But all things considered, picking up points where you can is all you can ask, even if it may cost in the championship battle over the full season. Massa had brief contact with Nico Rosberg at the start of the race, with left him missing some of the front wing. The team opted not to sacrifice time for a nose change, but that left Felipe struggling for balance and pace for the rest of the 69 laps. The problem Ferrari have at this moment is that the conditions in Hungary were opposite to those at Silverstone and in Germany, and yet they have been disappointed with every race result. If it is not the conditions making the difference, then what is it? And how bad must the car be that even Fernando Alonso can’t wrestle something from it? The result of this race is in line with our current potential: we knew this cycle of races would be difficult and that the fight for the podium at this track would be out of our reach. Car performance on both compounds did not give us any margin to attack, not even with a more aggressive strategy. Overall, the Hungarian Grand Prix weekend was a slightly more optimistic weekend for the Woking team, with a glimmer of progress being made over the last few races. Sergio Pérez managed to outqualify his far more experienced teammate, but settled for ninth on the grid without sacrificing another set of soft tyres. He lined up next to Webber, both on primes, but Sergio didn’t have the car beneath him to make the forward progress that the Australian did in his Red Bull. Instead, the fight forward came from Button who was not at all happy with the setup of the car on Saturday, and found himself lining up on the grid in 13th place. Jenson played a pivotal role in the race, being overtaken by Hamilton and being a roadblock for Vettel, but he was busy with his own afternoon as well. A great start put him up into the top ten almost immediately, although that did place him in the path of trouble. The collision with Romain Grosjean left him angry but not damaged, so he could continue his progress, ending up with a seventh place. It’s another double points finish for McLaren, in a season where they have sacrificed a lot for better times in 2014. From the original design decisions, to the switch of focus to next year, the team have already said this year is mostly a write off. And yet they are making slow but steady progress, and could overhaul Force India any day now. A point! At last. But it is so telling that a single point can be so exciting for a team that has previously won championships. It’s hard to tell if this is a corner that is being turned by Williams, or it was just one of those races that ended up working in their favour. They certainly looked, for a moment, as though they could put up a good fight in qualifying and perhaps even get into the top ten shootout. It didn’t last long as they were soon knocked into the drop zone, and in fact, pushed right to the bottom of it. Qualifying was close, but in terms of times, they were still half a second or more away from the target. That made things difficult on Sunday, but Pastor Maldonado made an excellent start from 15th, and made up some crucial places early on. He was hanging about just beneath the top ten, close but not quite close enough, until a handy retirement promoted him to the solitary point pickup spot. It may have been a piece of luck, but it’s one of those occasions where you have to be there to benefit, and in this case, Williams picked up the pieces. Bottas wasn’t there to help as his car ground to a halt, steaming, midway through. It was eventually put down to a hydraulics problem, with engine, gearbox and steering all affected. Despite a mixed result, the whole team do feel like they are improving and that will at least mean Claire Williams can be asked some slightly more positive questions in the paddock. The car felt consistent, maybe not as fast in the second and third stints, but very consistent. I really want to keep scoring points now and be even stronger during the second part of the season. Sauber have had their own problems to deal with leading up to this weekend’s race, but they could finally concentrate on the track action again – starting with slightly better results on Saturday. Although Esteban Gutiérrez was one of the drivers dropping out in the first session, he felt that the pace was there to do better. An engine problem had curtailed much of his Saturday practice running, so he was already starting behind everyone else. Reliability would prove to be a problem for both drivers on Sunday, too. Esteban suffered a gearbox problem which brought his race to an early conclusion. Hülkenberg saw the chequered flag, but missed out on the top ten. He could have been fighting for points but for a drive through penalty – caused by an issue in the pit stop that led to a panicked exit faster than the required speed limit. Team boss Monisha admits they were expecting some points, and have to take away the fact that they could have got some if mechanical issues hadn’t dogged their weekend. On a weekend where Jean-Éric Vergne had to put on his best "I don't mind being left behind" look and keep plugging away at his current situation, Daniel Ricciardo made the best of things again. For the fourth weekend in a row, he was a fixture in the top ten shootout, although didn't manage to qualify quite so high up as previous attempts. Compared to his teammate's performance though, it was another example of how much motivation can help! Participating in the extra session on Saturday turned into a hindrance for Daniel during the race, as he had one less set of tyres than Vergne and found himself falling back behind his fellow racer. Ricciardo also thinks the team are less good in the warmer conditions, which may not play into their hands at some of the coming races. Neither driver finished in the points, and that seems quite the disappointment for the team. Vergne even goes so far as to say he would prefer to finish behind his teammate as long as they were both inside the points. I can't decide if that is playing the team game, or if that's a clear indicator of why he was looked over for the Red Bull drive. there will be more hot races, so we must investigate ways of improving our car for these conditions. We have demonstrated again this weekend that the car is fast, as we secured a fifth consecutive top 10 grid start, but of course there are no points for that. The backmarker teams have more modest goals than their front-running counterparts, but they can still mean an awful lot when things go right. Caterham managed to get both cars ahead of the Marussia pair in qualifying, with Charles Pic ahead of Giedo van der Garde on the grid. Those positions were reversed on race day, as Giedo made a great start, getting ahead of the Williams and trying to stay in touch with the main field for the next few laps. The team’s main aim for the race was to stay ahead of their nearest rivals, and maintain their qualifying advantage. They achieved that, with Pic keeping in touch with his teammate. Notably, both drivers believe the tyres held up very well, with Van der Garde praising their tyre management and Pic boasting of extending his first stint by three laps as the rubber was holding up. It’s good to know the tyres are working for some! As a direct opposite to the good vibes coming from the Caterham garage, Marussia felt like they were struggling from qualifying onwards. Jules Bianchi admits to making a mistake on his flying lap which didn’t help him in the attempt to chase the green cars. Chilton felt he was fighting the car throughout, and echoed a similar thought on Sunday. Seeing Paul di Resta drop out of the first session of qualifying made my heart sink. Where we in for another team-bashing for the put-upon driver? Not this time, as it wasn’t a pit wall strategy error but a general lack of performance. Paul talked afterwards of his confusion, that they couldn’t figure out why they were suddenly losing pace. Sutil reiterated the idea of not knowing exactly where they were losing out during a lap, but he was further ahead – qualifying in the ‘best of the rest, choose your own tyres’ spot of 11th. Sutil had a poor start to the race, but felt like he was just starting to make progress when there was a problem in the pit stop. He couldn’t shift the gears to get going again, and the team retired the car – a poor end to his 100th Grand Prix. Di Resta wasn’t running much better, and he was called in to the pit lane for a similar problem just a couple of laps from the end. He was technically classified in 19th, but for all intents and purposes it was a double DNF. A weekend to put behind them, and focus efforts on making the most of the summer break for a better comeback in Spa.